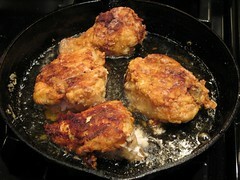 LTHForum.com - You Too Can Master Fried Chicken The LTHForum Way! You Too Can Master Fried Chicken The LTHForum Way! 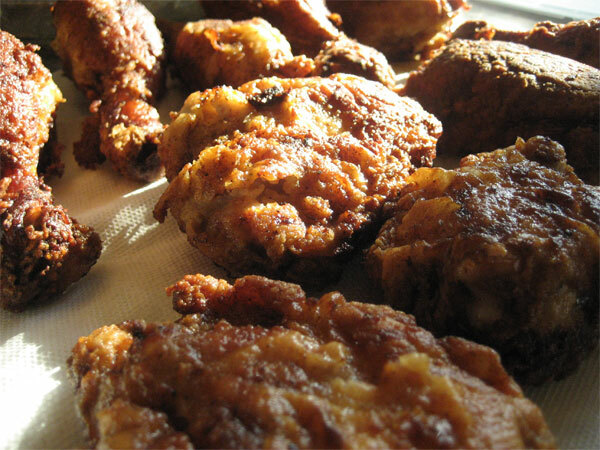 LTH Home > Chat > Shopping & Cooking > You Too Can Master Fried Chicken The LTHForum Way! So while visiting friends in Austin the conversation turned to all the strange things I cook-- pies with leaf lard and curing my own bacon and so on-- and one thing I said was that I'd been trying to learn how to make really good fried chicken. And that I'd progressed pretty quickly in this because of having all the great advice and experience shared here on LTHForum, primarily in this thread (named, ironically enough, for a recipe that didn't seem to work out for anybody). Hmm, fried chicken, said our hostess, who's particularly interested in Southern cooking. Would you show me how you make fried chicken? Well, again, I don't claim to be an expert. But having done it 9 or 10 times in the last year, with the help of all the information and advice in that thread, I do feel like I've gotten to be pretty darn good at it, good enough that I could at least get someone up to my speed pretty quickly. So I documented my process as I went along, and here is, from the collective LTH mind and containing the insight of a dozen or more folks, what I consider to be the basic LTHForum Fried Chicken process. Do this and you'll get up to pretty good quickly, and can then spend the rest of your life getting to great. Eatchicago wrote: As far as I'm concerned, if you don't have a cast iron skillet, you aren't going to be eating fried chicken any time soon. 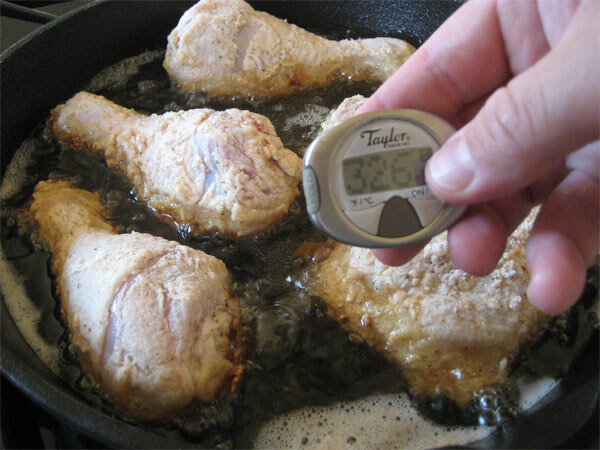 Also, unless you have a lot of experience frying on your stove with your pans, you'll definitely want a thermometer. 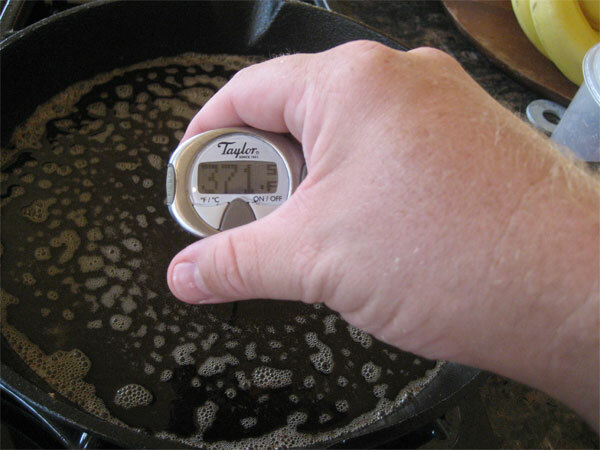 Oil temperature can make or break a fried dish. So I dispatched them to Bed Bath & Beyond, which they came back from with an Emeril cast iron skillet and a Taylor digital thermometer. I promptly cleaned and seasoned the skillet with a little peanut oil. 2. 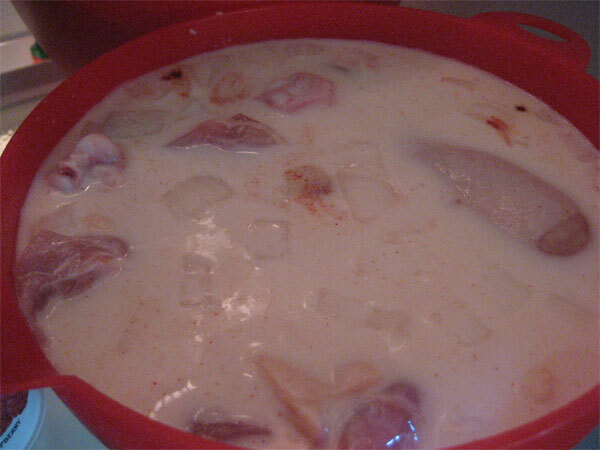 Next, we put the chicken in a brine consisting of buttermilk, a little paprika (I use cayenne or hot sauce at home but her father always used paprika, so paprika it was-- after all, ultimately you're out to evoke the memory of fried chicken from childhood), and some chopped onion. There are many other brines you could use (and I suppose technically this isn't really a brine, although it does get some salt from the buttermilk), but this one is easy and works for me. Normally, I try to stick with as few distinct spices as possible. 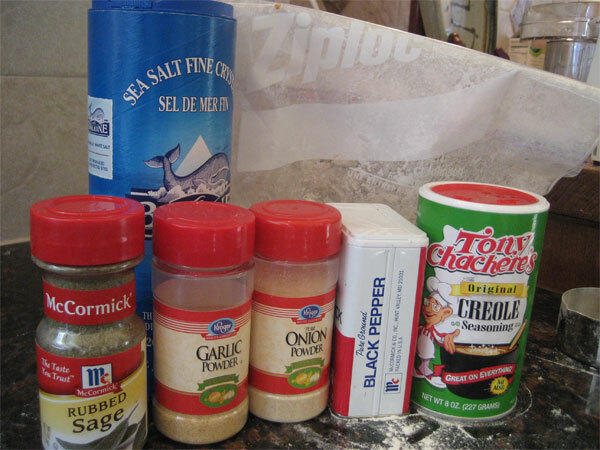 But I got the idea for using garlic and onion powder from some online recipe and I think it's really helped the flavor of the coating-- you don't taste either, perceptibly, but they sharpen the flavor just like salt and pepper do. Likewise, I don't toss in enough sage that you say "Thanksgiving gravy," just enough that chicken tastes more like chicken. The main thing, really, is to not be afraid of the salt and pepper. 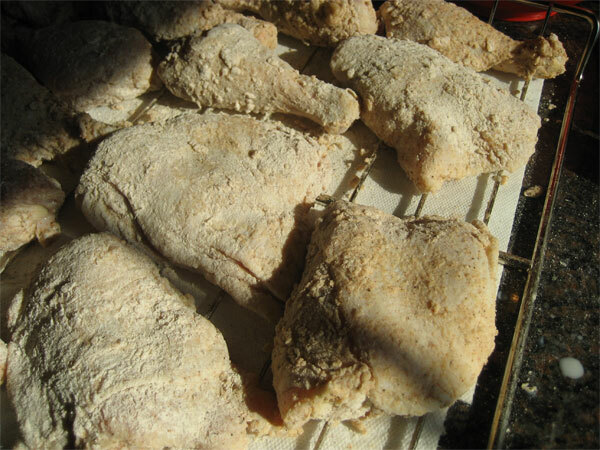 Use lots, the coating on any individual piece of chicken won't have that much in it. BR wrote: When you let the chicken rest, did you make sure that the pieces were thoroughly coated with the breading and dried? Gummy fried chicken is usually the result of the breading on the chicken not being dry enough when you place the chicken in the oil. 5. Put a quarter inch of oil in the skillet and heat to 370F. I use-- I think Evil Ronnie suggested this in person one time-- a heaping tablespoon or two of bacon fat tossed in along with peanut oil. If you don't want to do that, I also liked G Wiv's peanut oil plus a tablespoon or two of olive oil-- but I like the bacon fat (from my homemade natural bacon) better. 6. Chicken in, careful not to crowd or touch. Before, I brought the temperature back up to 350 to 370F. The result was usually a skin turned too dark. Now I aim for more like 325F as a cooking temperature, and that seems to work fine. 7. Turn the chicken after 10 minutes or so, mainly judging by color. 8. I can't judge doneness of fried, coated chicken. So I just stab it a lot with the thermometer and make sure it's all at least 165-170F (I know the government says 180F or more, I say that's enough). Take it out and tell me that isn't beautiful! 9. 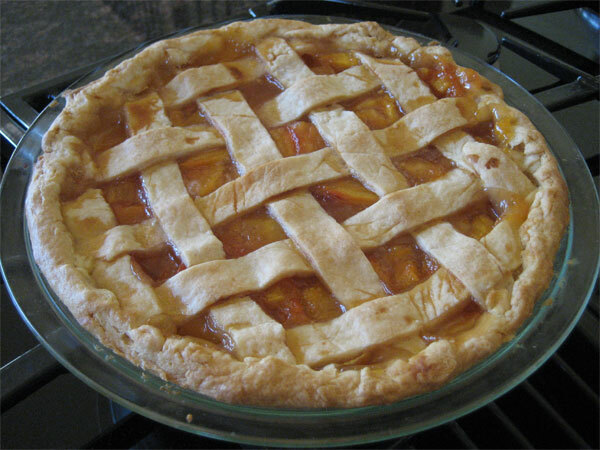 Follow with homemade peach pie. Evil Ronnie wrote: Perfect southern style fried chicken is almost as close as cooking gets an art form. You really didn't expect to reach nirvana on your maiden voyage, did you? Pinchas Zuckerman and Itzhac Perlman still practice five hours a day. Get yourself a cast iron skillet and keep frying. I'm quoted and now famous! Lots of people talk about making fried chicken extra crispy, and they think you have to double dip the chicken (buttermilk, flour, buttermilk, more flour). Not true. A single dip and a single coating will produce a beautiful and crispy crust . . . if you pan fry and don't deep fry. I also think that your step by step is a great guide, and I think your temperature guide is right on. For pan frying novices, I will say that the temperature and turning is key because it's much easier to burn the chicken when pan frying as opposed to deep frying. The chicken in your pictures has beautiful color. My tried and true method involves an overnight brine (salt water), then a good strong rinse the next day, followed by 4-6 hours of buttermilk (with some hot sauce) and then an all purpose flour breading to which I typically add black pepper and garlic powder (don't need more salt thanks to the brine) and sometimes add a little paprika, cayenne, sage and/or thyme. To me, the buttermilk and hot sauce is the most important part of the above formula -- makes the chicken tender and gives it a little sweet tangy flavor. As for pies, I must admit I'm an all butter type of guy. Though I must admit that it seems to me that the majority of bakers go for the butter/lard combo, but in my opinion, you just cannot beat the taste of an all butter crust. Yes, you lose some flake and its not always as attractive, but I think it's worth it. And when it comes to butter, I always make sure to stick to my European friends . . . a good pie filling should not be stuck with Land O'Lakes, Jewel or Dominick brand butter. I'm honored and hungry. Looks fantastic. Great post, Mike! Why is a cast iron skillet mandatory? Cogito wrote: Why is a cast iron skillet mandatory? Cast iron is so heavy that it retains the heat very well, making it easy to maintain a constant temp. Regular pans can't hold the heat, so there is a constant yo-yo effect with the temperature of the oil...especially just after putting the cold chicken in the pan. The temp drops so much in a standard skillet that you end up with greasy chicken. That is some beautiful chicken, Mike. Tell me - how do you all store leftovers for the requisite next-day cold-chicken picnic? I'd been tossing them in a ziploc in the fridge, but then sometimes have problems with condensation and the crust rubbing off. Any other ideas? So what about an electric skillet? They make it easy to control the temperature. And were your friends in Texas impressed? Peanut oil? Better not let any Southerner hear that you use anything but Crisco to make fried chicken! I used Alton Brown's method which is similar to yours, although he keeps the spice rub and flour separate to ensure you get a healthy dose of spices below the crust without them burning. Fujisan wrote: Peanut oil? Better not let any Southerner hear that you use anything but Crisco to make fried chicken! I prefer and use lard, occasionally leaf lard. If it's heavy enough to retain temperature, you could (though I wouldn't trust the dial without a thermometer to back it up). The point is, though, that it's heavy and hot enough not to fall too much when the cold chicken goes in. Any pan can get back up to heat, but a heavy one won't fall in the first place (too much; obviously it drops from 370 to around 325 in my example). Better not let any Southerner hear that you use anything but Crisco to make fried chicken! All the years that I worked in Southside of Virginia, most people used pure, locally produced peanut oil for frying chicken. It adds quite a bit of flavor to the meat. I will say that peanut oil was much harder to find in a Texas grocery store, they didn't have Planter's and the Lou-Anna brand had "peanut oil" in very small letters. jlawrence01 wrote: It adds quite a bit of flavor to the meat. I agree. I, too, use Alton Brown's method and find it wonderful EXCEPT for his calling for Crisco. I've used both Crisco and peanut oil and prefer the taste of the chicken fried in the peanut oil by a wide margin. I like Alton Brown's method, too. I especially like how he suggests the pieces should be arranged on the skillet so all the parts cook at roughly the same time. Thanks for the reach around Mike. And this Virginian uses Planter's peanut oil, enhanced with bacon fat, lard, or butter. As one of the chief beneficiaries of Mike G's fried chicken meals, I have become a fried chicken lover. I grew up never eating a home-cooked fried chicken meal as all stews and chicken were not allowed on the menu--my father would never again eat the Depression-era food his family had been forced to live on during his childhood. My only experience was Kentucky Fried chicken--yuck!--that my grandparents would order for birthdays celebrated at their house, until Mike's fabulous chicken arrived on my plate. The right mix of not greasy but not dry with fabulous skin is a real treat! We have the very best Embassy stuff. Well, I'm about to try it. . .gluten-free. I'll let you all know how it turns out. But, the skillet, thermometer and chicken soaking in buttermilk are all ready. ViewsAskew wrote: Well, I'm about to try it. . .gluten-free. What do you use to coat the chicken? can you use something like chickpea flour? Let me preface this by saying I've never made fried chicken and have eaten it rarely as an adult (or a child for that matter). Important only because I didn't have anything to compare it to. Because of a timing issue, the chicken was soaked in plain buttermilk. I have a second batch soaking now with hot sauce and onions in the buttermilk. I used similar spices as listed above, but used a bit of blackening seasoning and chili powder in place of the Creole spices listed above. For the flour mix, I used sweet brown rice, white rice, tapioca starch, and potato starch with a dash of xanthan gum. Though it requires me to keep at least 15 different starches and flours, using at least 3-5 together is the minumum for creating good taste and texture in most circumstances. I waited about a 1/2 hour for the chicken to air dry after I coated it - not sure if that was too long, but for my GF flours it seems to work fine. I put the chicken in peanut oil with a dash of olive oil preheated to 370, then kept it about 325 for the first 20 minutes. When I realized that the chicken was only at 135 degrees after 20 minutes, I turned it down a bit to about 315 to keep the coating from burning. Total cooking time was about 35 minutes to get it to 175. The chicken was delicious. I ate all my coating; normally I peel it off of most fried things. If anyone served this to me as a restaurant, I'd never question it being gluten-free, and I am the one that can eat gluten. The color was wonderful, it was crispy, and the flavor great. Only complaint was from Mr Views who has some strange need for chicken to be cooked until it falls off the bone (his mother and aunts' baking chicken pieces for 2-3 hours may be to blame). So, I might try brining it first next time and then baking it for an additional 1/2 hour after frying to see if he likes it more. Of course, he didn't leave any on his plate. . .given that he normally won't eat chicken unless it's chicken jello, that was a major accomplishment. Last edited by ViewsAskew on August 29th, 2007, 10:57 pm, edited 1 time in total. SteveZ, chickpea can work well for somethings, but I find it much too strong for a coating. It competes instead of complimenting. I actually have switched to navy bean flour. I soak the dry beans and then dry and lightly roast them. Then I grind the flour. Bean flours add great qualities to breads, but to me, only when used in moderation as the flavor can be aggressive, though least so with navy bean. White rice, brown rice, sweet brown rice, potato starch, potato flour, tapioca starch, amaranth, quinoa, navy bean, mung bean, sweet potato flour, millet, almond meal, Montina, corn starch, corn flour, arrowroot starch, buckwheat, and teff. Oh, I have fufu and another one I can't remember in the freezer (but haven't gotten to either of them to try them yet). As I mentioned above, GF flours rarely do well on their own. Combining them for taste and texture seems critical to GF baking/cooking success. I currently use 12 flours in the sourdought pancakes I make, lol. But, boy are they good. I truly think that they would sell in a restaurant as an expensive gourmet mixed grain pancake and no one would ever question they were missing wheat, nor would they want it. What is it about people from Kansas? My girlfriend is from Kansas, and though I boast significantly more Southern stature than her (father from Winston-Salem, mother from Nashville), she can absolutely decimate me in a fried-chicken contest, using her mother's (who's from Kansas--Salina) electric skillet. 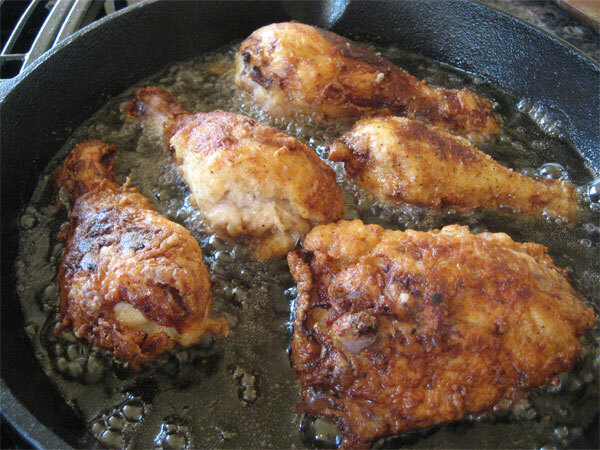 I've met a lot of people that will only use electric skillets for their fried chicken, though, in viewing the process, it looks not so precise. Of course, this is usually through the haze of several six or seven or twelve Tecates. Update 2: I had only taken out 4 pieces of chicken I'd had in the freezer for this experiment. Mr Views seemed keen on having this - he's not had any fried chicken since diagnosis of celiac over ten years ago. So, while the chicken was air drying, I walked over to Whole Foods and bought some potatoes and another fryer. When I removed the first pieces, I threw in three more and added hot sauce and onions. We ate the first batch and it was good. Just now I realized the chicken had been soaking for about 4 hours and I'd rather do it now than tomorrow. So, I made up some more flour mix - but with different proportions as I was low on sweet rice flour and didn't want to grind it. I also reduced the salt slightly, then dredged and set to dry. I noted earlier that the chicken was not as done as Mr Views likes, so I cut the breasts in half and then butterflied them. I ened up with one small piece of breast meat on its own, so I coated it, too. I didn't want to wait long, so they only air-dried for about ten minutes, tops. A couple of moist places just got an extra pat of flour and in they went. This time, they were completely done in 20 minutes - it was only three pieces, though. Oh, and the little nugget. I took it out after about 8 minutes. WHen I took the rest out - easily hitting 185 this times - I bit into the nugget. OMG! It was truly delicious. More juicy that the first batch and wonderful flavor. Not sure what happened to make the second batch so much better. Three guesses, but truly just guesses. First, I added the hot sauce to the buttermilk. Maybe this added to the brining in some way. Second, I didn't brine as long - so I wonder if you can leave them in there too long and 3-4 hours is more optimal. Lastly, butterflying allowed me a LOT more surface area for coating and allowed them to cook more quickly. No pictures. I'm too tired and may finally head off to bed. . .the greasy stove can wait until tomorrow. ViewsAskew wrote: Not sure what happened to make the second batch so much better. The fact that you used fresh, rather than previously frozen chicken could have had something to do with it. too. By the way, that chicken looks excellent . . . great color. I can only imagine how good that picture would taste at Moto! SteveZ - I thought about that and forgot to post it. Glad you did. So, is that really that much of a factor? Both chickens were organic, etc. Huge difference in moisture. But, that makes sense, huh? Freezing dries things out, doesn't it? Edited to add: wonder if brining is essential when using frozen meat? ViewsAskew wrote: SteveZ - I thought about that and forgot to post it. Glad you did. So, is that really that much of a factor? This is a topic of some debate. I feel that freezing meat in home freezers ruptures the meat's cell structure resulting in slightly dried out and/or mushy meat when thawed and cooked. I won't have it in my house. Others claim they can see no difference between fresh and frozen. More power to them, I suppose. I guess I think of it like this: a freezer - or fridge - does it's job by removing moisture (if I remember my brief intro into refrigeration repair correctly). How can than NOT affect the moisture content in the food? Mhays wrote: That is some beautiful chicken, Mike. Though its probably not the ideal way to store it, I do it like Alton. I buy disposable paint buckets from the hardware store and use a paper plate as a lid. I'm no big fan of KFC but there's something comforting about having a bucket or two of homemade fried chicken on hand. Me too - preferably Bruce's hand-delivered lard from Georgia. I also like Edna Lewis' trick of adding a piece of country ham to the pan to the lard to give it an even more porky flavor. And now I get to extol the virtues of what some may suggest to be a useless kitchen gadget: the laser thermometer. I love this for deep frying, for candy making, for bread baking (monitoring the water temperature) and even for checking oven temperatures in unfamiliar ovens. For deep frying, you can easily monitor the temperature of the oil without having to worry obout a deep fry thermometer flipping up and splattering oil.